When a relationship ends, it’s pretty important for the people involved to move on. No one ever said that it was easy, and it often takes a long time for both parties to do so, regardless of whether the decision to split was mutual. In some cases, one person needs much more time to get past it, and a complete separation is usually necessary after a close, lengthy relationship before transforming the dynamic into a workable friendship is possible. One particularly unproductive step is the very unadvisable decision to move into the same building where an ex lives. 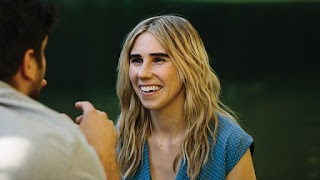 After spending two years in London, Diana (Zosia Mamet) returns to New York City, where she works in a wedding dress shop. Prior to her departure, Diana dated Ben (Matthew Shear), and used her international relocation as an excuse to end their relationship. 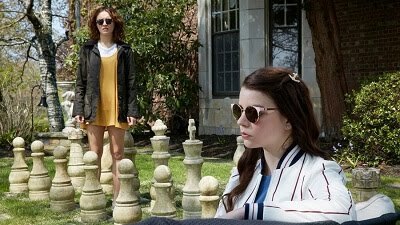 When a realtor, Meg (Sarah Ramos), shows her an apartment building, she falls in love, and it’s only after all of her furniture is delivered that she delivers that her downstairs neighbor is none other than Ben, who just happens to have a new girlfriend: Meg. Being a young adult and navigating the dating world is hard enough without the added pressure of running into your ex-boyfriend when you’re taking out the trash or heading out for work in the morning, and, as with any film of this sort, the temptation to rekindle what once was exists on an almost constant basis thanks to simple reminders of times shared together. Flashbacks tell the story of how Diana and Ben got together in the first place as their new experiences play out in the present, creating an effective double narrative that strengthens the identities of both characters. Mamet is best known for playing the talkative, hyper Shoshanna on HBO’s very recently-wrapped “Girls.” There are similarities between Diana and Shoshanna, though the slightly less chatty Diana manages to handle the situation infinitely better than her TV counterpart would, still creating awkwardness at every turn but less as a result of things that she herself says. Mamet does great here, with stable support from Shear and a humorous supporting turn from Ramos, who played a much more understanding teenager on “Parenthood.” Aside from its clever premise, this decent comedy doesn’t offer many new ideas, but it’s a perfectly passable and entertaining showcase for Mamet tackling finding love in New York City from a slightly different angle.